There are a lot of different gun belts on the market, but not all of them are created equally. For many people, all a belt needs to do is securely hold up their pants and match their outfit. Anything beyond that isn’t really necessary and a belt from just about any store will do. However, gun owners and especially those that conceal carry, are a much more demanding group when it comes to their gun belt. Not just any old belt will do and not all gun belts are created equal. There are a lot of important features that set a great gun belt apart from a good one. Let’s take a look at some of those features below. 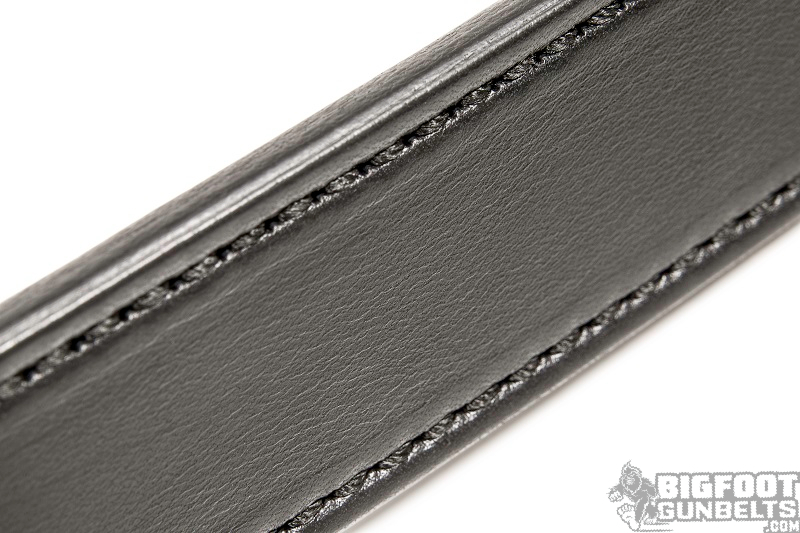 A spring-steel core is a feature found in a top of the line leather gun belt. It offers a massive increase in stability and support for a holster and gun of any size. In gun belts that have a spring-steel core, the core is sandwiched between two layers of leather. There will be no question about a gun belt’s strength when a spring-steel core is involved. Forget all of those exotic materials that some gun belts are made of. It is hard to beat good old English bridle leather for a gun belt’s material. 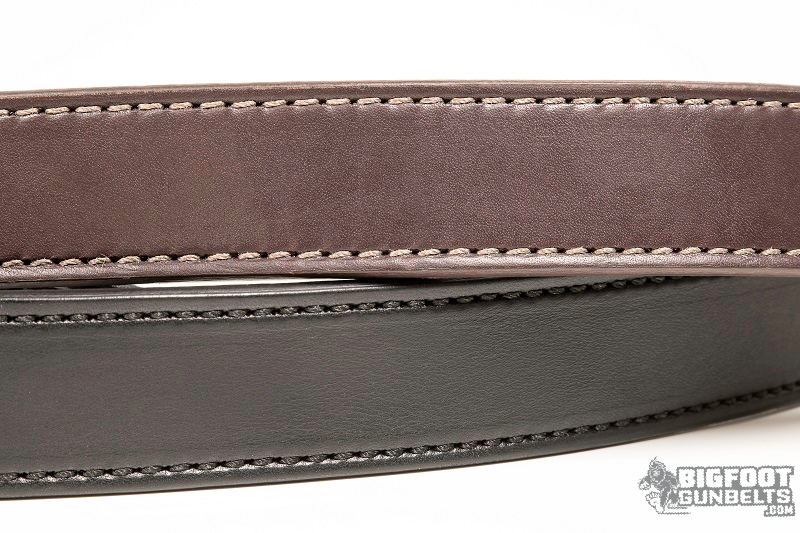 Not only is it tough and long lasting, but this leather belt is also affordable and low maintenance. Premium drum dyed English bridle leather last for years and makes for a very handsome way to support your weapon’s holster. While the material comprising the actual belt is important to consider, the material holding it all together is just as, if not more, important. A gun belt made from the finest leather, but held together with flimsy thread isn’t going to be a well performing piece of concealment clothing. Premium military grade thread , with its thicker diameter and greater strength, is vital to a high-quality gun belt that won’t have the layers separate over time. Having the hardware on your gun belt begin to rust, or succumb to any other deterioration, typically means buying a new gun belt. That is why corrosion resistant hardware is a part of any high-quality gun belt. A nickel-plated buckle also means that the belt will be easier to put on as the leather will slide right through with no holdup. It’s all in the details. Even having all the best materials for a gun belt doesn’t mean that the belt is going to look good while also performing well. Having the skilled hands of a team of dedicated craftsmen working on each belt means that every single belt is going to look like it cost hundreds of dollars. A smooth and uniform finish is the only acceptable outcome. A leather gun belt doesn’t have to be ugly or utilitarian and you shouldn’t settle for that. Where one layer is good, two is often better. That holds true for double-stuffed Oreos, sleeping bags and yes, even leather gun belts. The days of a sagging and twisting gun belt are a thing of the past when the belt is made with a double layer of English bridle leather. Twice the strength and stability is exactly what the discerning gun owner wants. When all of the features listed above come together, you can bet that the end result is a gun belt that will not fail under stressful circumstances. You can also count on that belt to last you for years to come. A high-quality gun belt is necessary for anyone who carries a firearm on their hip. Don’t make the mistake of purchasing anything less than a leather gun belt with all of the features mentioned here.